This is how I am welcoming the Christmas season!!! 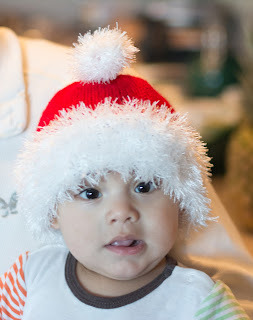 I could not wait to see baby Nicholas with the Christmas hat... It came together really fast and fit him perfectly. The specs: the red yarn is Encore by Plymouth Yarn Co., the white is Eskimo, size 7 circular needles (7"). The pattern (from Leisure Arts) has you knitting the pom-pom. After trying it a couple of times I gave up and the crochet hook came to the rescue. I did not put anything inside the pom-pom as crocheting it tightly helps it keep its shape. I am happy Mary at Heindselman's showed me the hat she had made - I just had to make one for my grandchild. So this is my finish for today... I will be enjoying Nicholas instead of joining the throngs of people shopping for after-Thanksgiving bargains. Well, maybe later I will succumb to the temptation and look for a small Christmas tree, as the puppy will definitely tear apart our floor to ceiling one. Darling Baby and cut hat too. What a great job you did. I'd rather be cuddling that sweet thing instead of shopping too. Awwww how sweet and the little boy too! We just followed your blog! Please come follow us back! Thanks.